The finest most functional game call lanyard on planet earth. Adjustable & expandable, accomodates waterfowl bands. All calls and accessories can be individually adjusted to any position on the lanyard. High tech detachable locking system easily clips apart for the addition or deletion of calls, accessories or waterfowl bands. Non-abrasive to hunter's neck. Extremely light and flexible. Holds up to 4 calls. Includes a free dog whistle. Made in the USA! 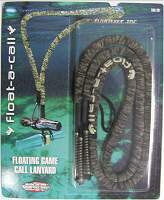 The world's first floating game call lanyard. Will float 1 to 4 calls. Designed for comfort, is non-abrasive to hunter's neck. Completely constructed of soft foam and cloth. Extremely light and flexible. Comes with 4 spring connectors. Made in the USA! A floating call lanyard with adjustable drop positioning and a split ring drop for whistle or compass. Non-chaffing to neck. This 3 drop model floats 2 to 3 calls. Made in the USA! TFloats one call. Has a split ring for dog whistle or compass. Made in the USA! Conveniently keeps your calls safely around your neck and at your fingertips. This practical hunting accessory may be overlooked by some, but once you use one of our lanyards you won't hunt without one again. Calls sold seperately. Nylon Double Lanyard. Holds two calls. This lanyard will make keeping your call in place an easy job. Our most popular lanyard. The two loops will carry your favorite calls. Three loops make this a tool for the hunter who carries more than two calls at a time.